In a split-system central air conditioner, an outdoor metal cabinet contains the condenser and compressor, and an indoor cabinet contains the evaporator. The indoor cabinet also contains a furnace or the indoor part of a heat pump in many of the split-system air conditioners. The air conditioner’s evaporator coil is installed in the cabinet or main supply duct of this furnace or heat pump. 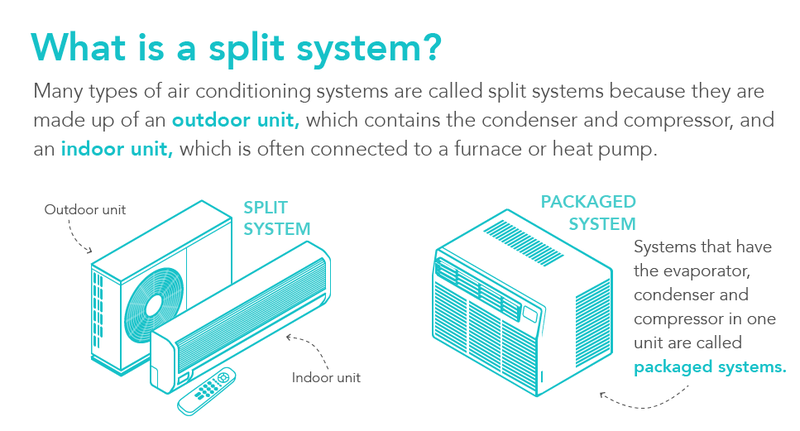 A split-system is the most economical central air conditioner to install if your home already has a furnace but no air conditioner. 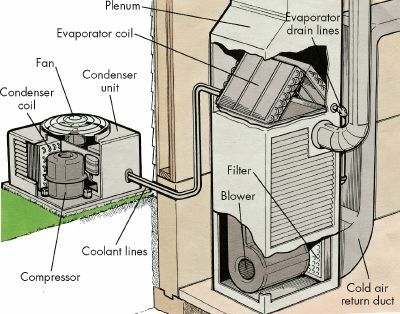 In a packaged central air conditioner, the evaporator, condenser and compressor are all located in one cabinet, which usually is placed on a roof or on a concrete slab next to the house’s foundation. This type of air conditioner is also used in small commercial buildings. Air supply and return ducts come from the indoors through the home’s exterior wall or roof to connect with the packaged air conditioner, which is usually located outside. These can often include electric heating coils or a natural gas furnace. This combination of central heating and air conditioning eliminates the need for a separate furnace indoors. 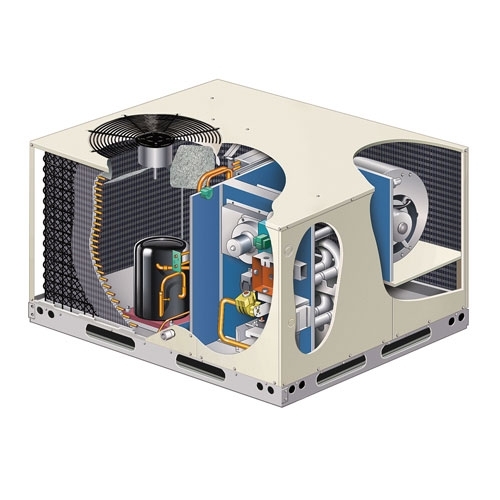 Central air conditioning systems are thermostatically controlled and convenient to use. Central air conditioners circulate cool air through a system of supply and return ducts. Supply ducts and registers carry cooled air from the air conditioner to the home. This cooled air becomes warmer as it circulates through the homed. The warm air then flows back to the central air conditioner through return ducts and registers. Indoor humidity can cause many problems. Too much humidity in the air causes you to feel warmer, meaning it costs you more to run your air conditioning system longer. By selecting a thermostat with a humidity control feature, this could save you up to $300 per year and will also increase comfort in the home especially if you live in a humid area. Air conditioners help to dehumidify the incoming air, but in extremely humid climates or in cases where the air conditioner is oversized, it may not achieve a low humidity. Running a dehumidifier in your home will increase your energy use, both for the dehumidifier and because the air conditioner will require more energy to cool your house. A dehumidifying heat pipe, which can be added as a retrofit to most existing systems, is a preferable alternative. If you are considering adding central air conditioning to your home, the deciding factor may be the need for duct work. Central air conditioners are more efficient than room air conditioners. They are out of the way, quiet and convenient to operate. Purchasing an energy-efficient air conditioner will save money, and reduce you central air conditioner’s energy use. In an average air-conditioned home, an AC consumes more than 2,000 kilowatt-hours of electricity per year, causing power plants to emit about 3,500 pounds of carbon monoxide and 31 pounds of sulfur dioxide. If you would like to install a central air conditioning system or have an annual inspection on your system, call ACE HI PLUMBING, HEATING & AIR AT 970-667-0300 today to schedule an appointment. We offer services in the Northern Colorado area and have 24-hour emergency service available. Trust us to keep you and your family cool this summer. Making sure our customers are completely satisfied is our first priority. Today’s best air conditioners use 30% to 50% less energy to produce the same amount of cooling as air conditioners made in the me 1970s. Even if your air conditioner is only 10 years old, you may save 20% to 50% of your cooling energy costs by replacing it with a newer, more efficient model. Proper sizing and installation are key elements in determining air conditioner efficiency. A unit that is too large will not adequately remove humidity. A unit that is too small will not be able to attain a comfortable temperature on the hottest days. Lack of insulation and improper unit and duct installation can greatly diminish efficiency. SEER stands for Seasonal Energy Efficiency Ratio, a measure of system efficiency, which translates to how much it costs to operate and indicates the relative amount of energy needed to provide specific cooling output. The higher the number, the more efficient the system. A SEER rating of 16 or higher with stepped capacity modulation is considered high efficiency and could save you over $400 per year versus an older lower efficiency system. Many older systems have SEER ratings of 6 or less. The minimum SEER allowed today is 13. Central Air conditioners are rated according to their SEER rating. If you are thinking about purchasing a new air conditioner, look for a model with a high efficiency or look for the ENERGY STAR® label for central air conditioners with SEER ratings of 13 or greater. Also consider using air conditioning equipment with higher SEER ratings for greater savings. New residential central air conditioner standards went into effect on January 23, 2006. Air conditioners manufactured after January 23, 2006 must achieve a SEER of 13 or higher. SEER 13 is 30% more efficient than the previous minimum SEER of 10. The standard only applies to appliances manufacture after January 23, 2006. Equipment with a rating less than SEER 13 manufactured before January 1, 2015 may still be sold and installed anywhere in the U.S. If you are in the North region, as specified by the DOE, you may continue to install SEER 13 AC systems even if they were manufactured after January 1, 2015. There is not yet a date for phasing out those units in the North. However, All heat pump systems built after January 1, 2015, must be at least a SEER 14. If you are located in the South or Southwest DOE regions, you can only install SEER 13 units (AC or heat pump) built before January 1, 2015, and you can continue to do this until the 18-month grace period is over on June 30, 2016. After this date, everything in those regions must be SEER 14 irrespective of when it was built. Also, the Southwest region has an EER (Energy Efficiency Ratio) minimum in addition to the SEER minimum, so homeowners in the region will need to watch for the EER rating as well. It is not clear how the availability of SEER 13 units built before January 1, 2015 will play out, but there are certainly some in the channel for the 2015 cooling season. It is likely that this availability will drop significantly as we move closer to the June 30, 2016 date when they can no longer be used (except in the North). The standards do not require you to change your existing central air conditioning units, and replacement parts and services are still available for your home’s system. The “lifespan” of a central air conditioner is about 15 to 20 years. Manufacturers typically continue to support existing equipment by making replacement parts available and honoring maintenance contracts. For questions concerning your air conditioning unit, call ACE HI PLUMBING, HEATING & AIR at 970-667-0300 today. We have NATE-trained technicians and provide 24-hour emergency service. Ace Hi Plumbing services the Northern Colorado area including Loveland, Fort Collins, Berthoud, Longmont, Windsor, Greeley, and Estes Park. Spring clean your drains with our plumbing services in Fort Collins. When it comes to cleaning, people often forget about household surfaces that are not in plain sight. Just like your countertops, mirrors, and floors the inside of your drains need to be cleaned too. Without proper drain maintenance, unexpected clogs are bound to pop up sooner or later.In fact, it is important to incorporate drain cleaning into all your major cleaning routines. Doing so will help keep clogs away and avoid costly repairs in the future. If you are not sure how to go about cleaning your drains don’t worry you are not the only one. To clean your drains, remove the stoppers throughout your home. Clean each one thoroughly, as food, soap scum, and hair can easily cling to stoppers and create problems. Next, test each drain by running water to see if it drains slow or normal pace. If it is clear, you can use a clog prevention treatment for regular maintenance. If it is running slow you will need a more specific clog treatment to get whatever is in the drain to move through. Prevention on a monthly basis is key to clog free pipes. As you are continuing through this routine, be sure to clean all the drains in your home. There are a few that are easy to forget (laundry room drains, garage drains, guest bedroom drains). With these simple steps, your drains and pipes will remain clog free. However, there are some clogs that need professional help and we are here for you! The installation of your air conditioner in Fort Collins is the first step in determining the success of your air conditioning system. Even the best air conditioners on the market will not be able to adequately cool your home if they are not properly installed. Efficiency will suffer,costing you more money to cool your home. The effectiveness of your air conditioner will drop. Schedule a professional air conditioning installation service to get the most out of you ac unit! Since 1992, a major shift in the air conditioning industry has been underway. R-22 refrigerant, often called by its brand name Freon, has been being phased out in favor of a new type of refrigerant, R-410A, often called by its brand name Puron. This has some big implications for homeowners who are repairing or replacing their air conditioners. Also, as a homeowner considering a purchase, it is important that you understand the difference between these two refrigerants in order to make the best decision for your system. R-22 has been the standard refrigerant used in air conditioners for many years now. The problem with this refrigerant is that it is both less efficient and less environmentally friendly that R-410A refrigerant. In 2010, R-22 was outlawed for use in new units. The government-mandated shift away from R-22 refrigerant is an attempt to make homes more efficient and reduce the emissions of greenhouse gasses into the environment. There is a limited supply of R-22 and the price will increase as the supplies diminish. R-410A offers greater efficiency, saving you in energy costs, and is much better for the environment. Dry charged units typically offer much shorter warranty periods. As of 2010, this refrigerant is no longer allowed to be used in newly manufactured air conditioners. R- 22 is a Hydro-chlorofluorocarbon (HCFC) which contributes to the depletion of the ozone layer. It is less capable of absorbing and releasing heat than R-410A refrigerant, making it less efficient. It is becoming more and more costly as its use is phased out. R-410A has been approved for use in all newly manufactured residential air conditioners. In 2015, R-410A will become the new standard for U.S. residential air conditioning systems. It is a Hydro-fluorocarbon (HFC) which does not contribute to the depletion of the ozone layer. It is better at absorbing and releasing heat than R-22 refrigerant, making it more efficient to use. Requires the use of tougher, more durable air conditioner parts, which reduces the risk of your system overheating and breaking down. Although R-22 refrigerant is still available to replenish older systems that have refrigerant leaks, the cost of that repair is on the rise. Because R-410A requires different air conditioner components than R-22, you cannot replenish a system that uses R-22 refrigerant with R-410A. R-410A functions at a higher pressure than R-22, so new compressors are built to withstand greater stresses, reducing the chance for cracking. If you were to put R-410A refrigerant into a system designed for R-22, the pressure would be too much and the unit would break. In order to reap the efficiency, performance and environmental benefits of R-410A refrigerant, you will need to install a new system that is designed to use the refrigerant. If your air conditioner is nearing the end of its operating life, R-410A refrigerant might be a good reason to replace your system sooner rather than later so that you can avoid the rising costs of repairing a refrigerant leak with R-22 refrigerant. If you have questions about R-22 or R-410A refrigerant, or if you would like to have a new cooling system installed or your current system serviced, call ACE HI PLUMBING, HEATING & AIR at 970-667-0300 today to make an appointment. We have NATE-trained technicians and provide 24-hour emergency service. Ace Hi Plumbing services the Northern Colorado area including Loveland, Fort Collins, Berthoud, Longmont, Windsor, Greeley, and Estes Park.